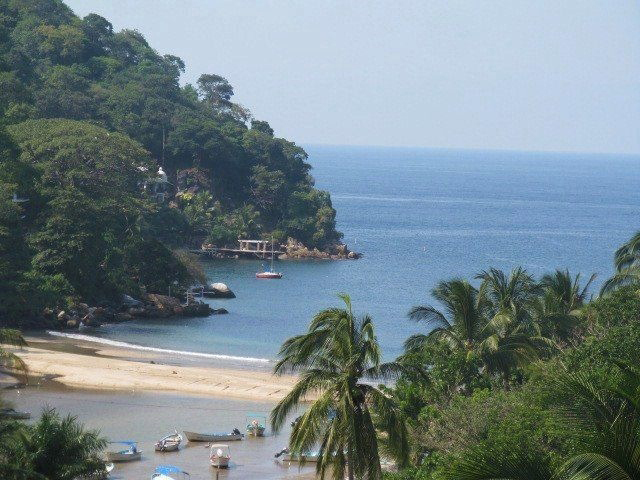 Boca de Tomatlán is an authentic Mexican fishing village, 10 miles (16 kms) south of downtown Vallarta, accessible by land or water. 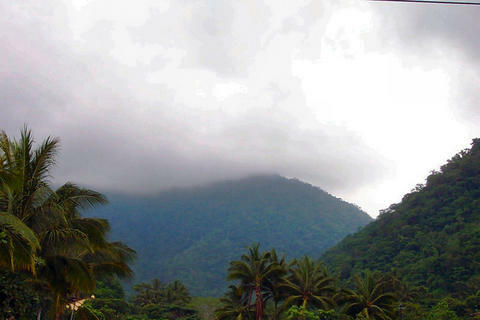 The village is situated on the mountainside, the Horcones river and the Boca Bay. You'll find most of the businesses, restaurants, many rentals and parking on the east side of the river. We experience hot and humid weather with lots of precipitation in the summer/autumn, and then enjoy fantastic warm days and breezy evenings in the winter and spring months. 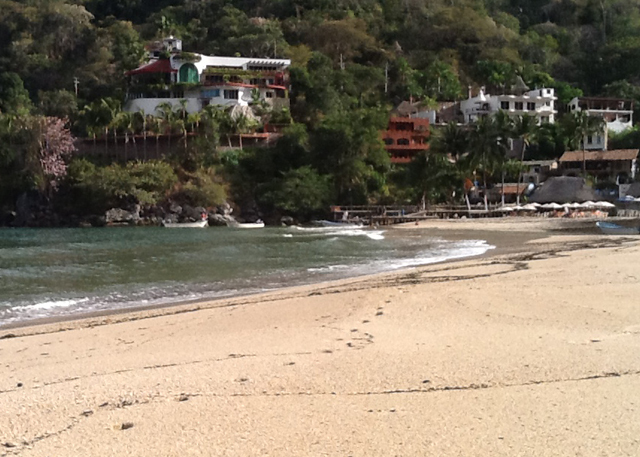 Boca's beach and river transform annually, and offer the calmest waters anywhere in Vallarta. 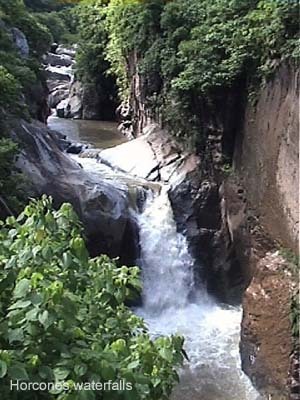 The Horcones River reaches its maximum width during the rain season, flowing abundantly and forcefully. 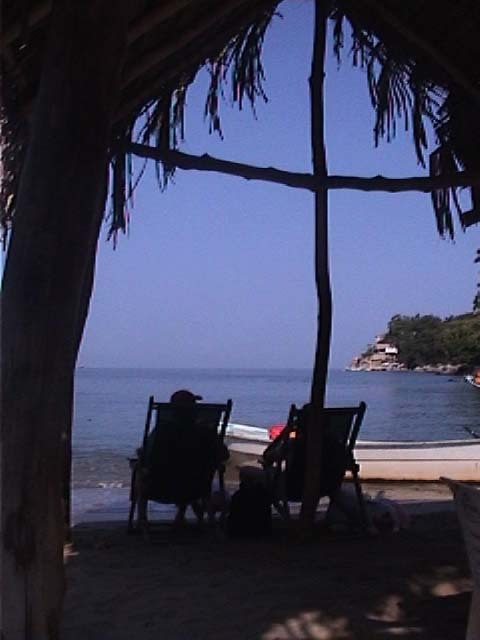 The beach serves as port to watertaxi's heading towards Las Animas, Quimixto, Majahuitas, and Yelapa (beaches only accessible by sea). Dock available in Boca. 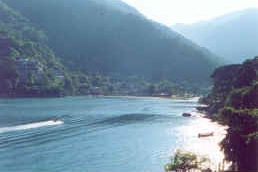 Boca de Tomatlán is the last stop on the highway connected to the southern coastline. 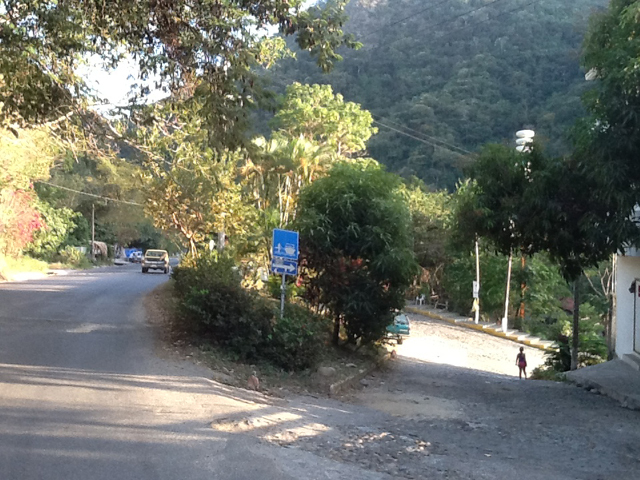 If you continue south on the highway, you would drive into Las Juntas y los Veranos, and further ahead, at El Tuito, both rural towns.A visit to El Tuito (founded in the XVI century), approximately 28 kms distance from Boca de Tomatlan, is like traveling back in time. There is lots of activity in Boca everyday. At sunrise every morning, the local fisherman return to the beach with the seasonal catch, and are amenable to offering their product to anyone interested. Convenience stores usually are open from 8am till late in the evening. Palapa beach restaurants and shops run between 10am and 6pm. Several restaurants and taco stands may stay open till later in the evening, while others only open weekend evenings. There are public phones located around the town; a cybershop (internet) available to students and public in general; and if you have your own laptop, ipad or other device, high speed internet and regionally grown organic certified coffee available at the dive shop. 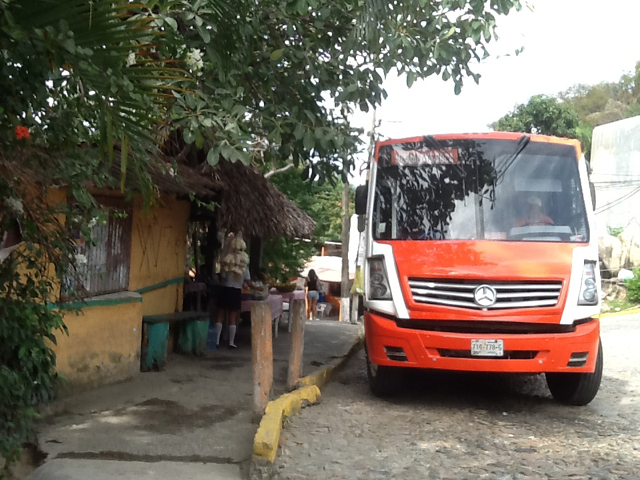 The bus service runs between Boca de Tomatlán and downtown Vallarta everyday, starting at about 6:30am, the last bus coming in at 11pm, at intervals of 5 minutes, and later in the evening (7pm), every 1/2 hour. The bus stops up on the hill of the Boca main street "Calle Pelicanos" and then u-turns back to it's downtown Vallarta stop at the corner of Basilio Badillo and Constitucion St.,"Centro". Cost per person is 7 pesos one-way. Taxi service can be arranged. Also, several neighbors, with large cars or trucks, are always amenable to transporting tourists. Bus preparing to return to downtown Vallarta. There is a long list of rental options in Boca, including villas, apartments, studios, rooms and bed&breakfasts. These rentals are located on both sides of the river, but those on the westside may be reached by foot only. To access the westside, you can choose to cross either a concrete or a hanging bridge, or walk across the river, water level permitting. Small pangas (boats) or "bellboys" are available to transport you and your luggage across, "don't forget their tip". All rentals offer once a week maid service, basic amenities, and property managers who are usually available during normal daylight hours. Some rentals offer extra maid and laundry service for an additional fee. 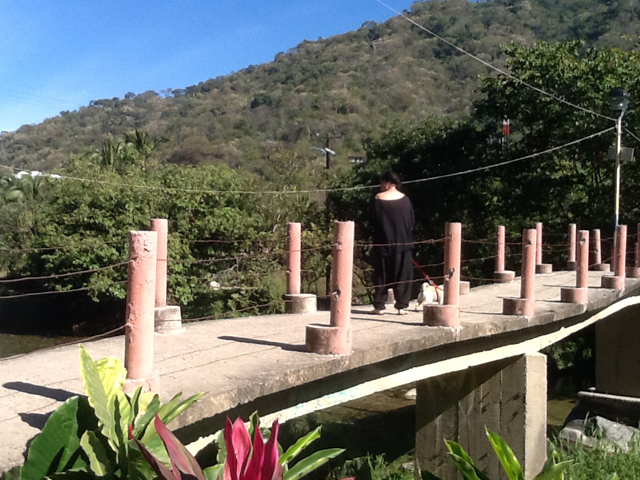 Keep in mind that Boca de Tomatlán village is located in the jungle on irregular terrain. Consider your level of physical stamina and need for certain comforts when choosing to stay in Boca. The adventure possibilities in the area are endless. If you are a water lover, you can engage in activities such as snorkeling, scuba diving, fishing, kayaking, paddle boarding and swimming. Or perhaps trekking into the hillsides, or going for morning walks up a river system, or even exploring secret waterfalls created by the abundant rainfall during the rain season. Want to learn something new, while in Boca? The whisky destillery recently opened it's doors and offers a guided tour. Or maybe try Janzu - deep relaxation aquatic sessions. Spanish lessons can also be arranged. At very short distances from the town, you can go hook up on a Canopy Tour (zipping along the treetops), horseback riding through the jungle, or visit the Vallarta Botanical Gardens. 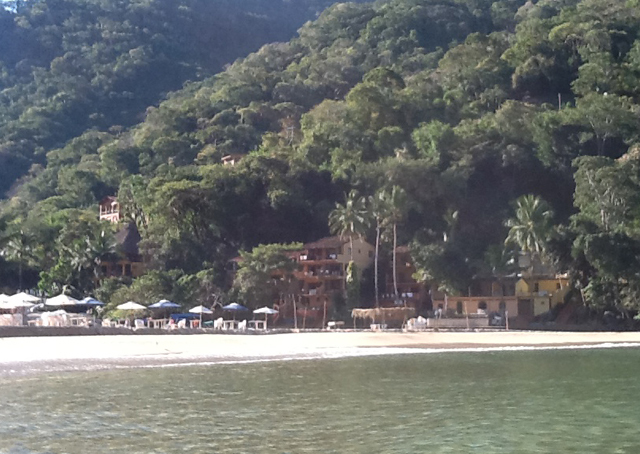 Too much action?...how about just enjoying a cold one and some "totopos y salsa" under a palapa on the beach! Don't forget to ask about the Raicilla! 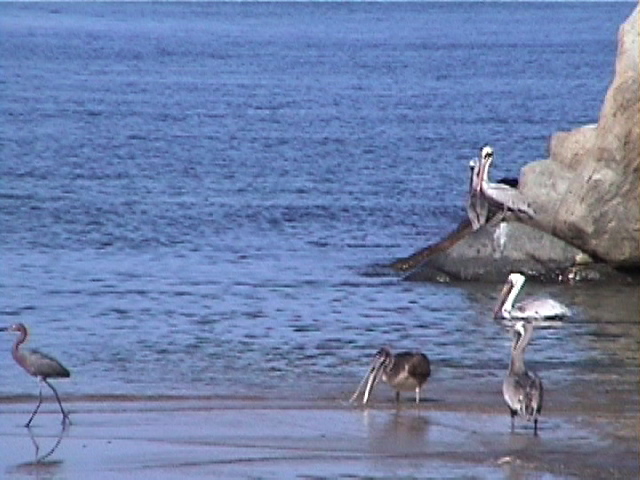 The Boca cove is home to many birds, including the Military Green Macaws, wild parrots, Booby Birds, Brown Pelicans, Magnificent Frigatebird, Terns, Herons, Egrets and more. And in it's water, all kind of aquatic life may be observed. We've been privileged to enjoy the humpback whales, during their seasonal visits, as well as turtles and dolphins all year round. Snorkeling can be done in the bay, just be cautious to remain along the coastline, away from the beach and boat traffic. Snorkel and scuba gear can be rented or purchased at the local dive shop. Wish to participate in the local conservation efforts? These are a few to choose from: Macaws Forever, Ayudamutt. All in all, Boca de Tomatlán is a quaint, busy little village, with charming residents that will certainly make you feel at home. 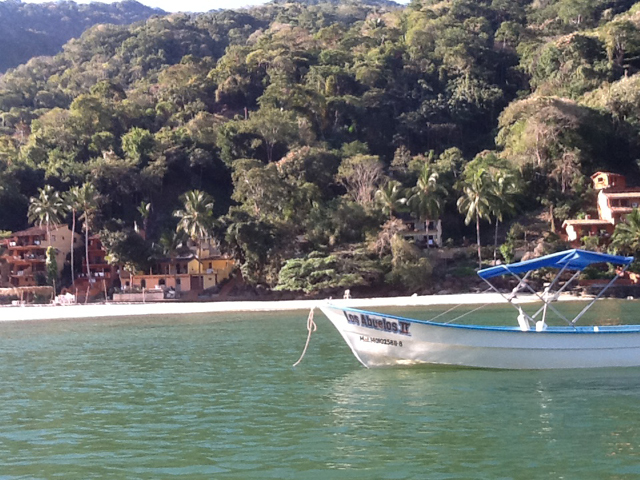 You'll surely find the many pleasures of paradise here, and yet be a comfortable distance from Vallarta. 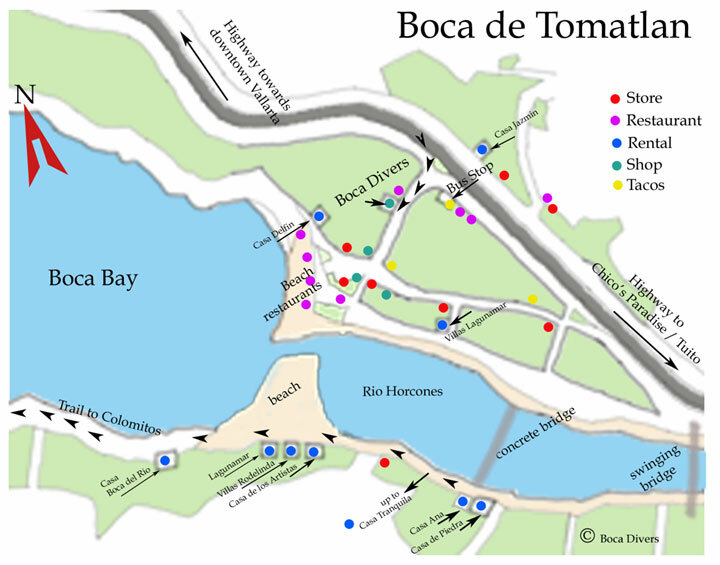 Here is a handy checklist of items to bring to Boca de Tomatlan. Needs may vary depending on the individual budget, length of stay or accommodations selected. Note: Most of these items are found locally in Boca de Tomatlán or in Vallarta. 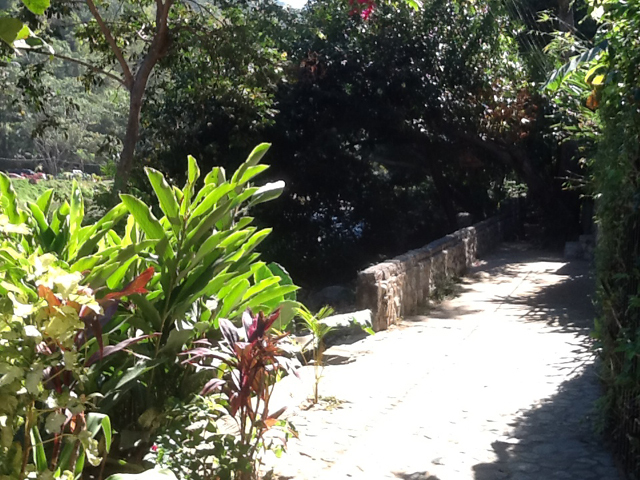 Businesses in Boca de Tomatlan accept cash only, US dollars or pesos. Travelers cheques are better cashed in downtown Vallarta. Please note, at the time of posting this map. several establishments (accommodations, restaurants and shops) have formalized operation and others have ceased to exist. 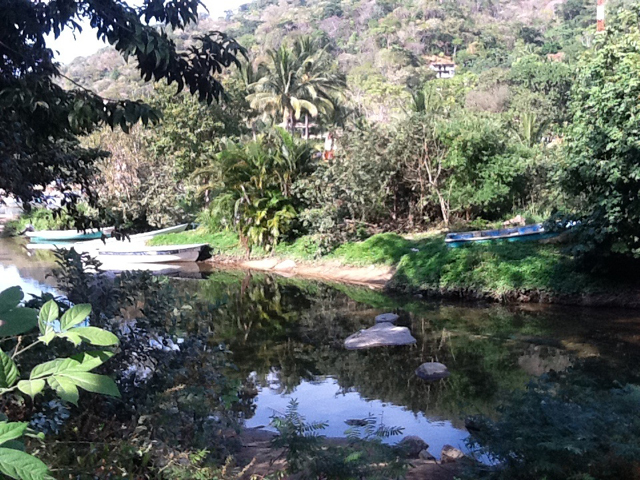 Boca de Tomatlan continually grows, as does it's array of options. For further information and detailed map < click here >.